College receives positive feedback from students following new canteen. Nelson and Colne College is a Further Education college based in Barrowford, Lancashire. It is top in Lancashire for A Levels and top in the area for vocational studies. It is home to 1,600 full-time students and has recently been named number one in the country for apprenticeship success. Our supplier European Furniture Group (EFG) is a leading provider for interior office solutions. 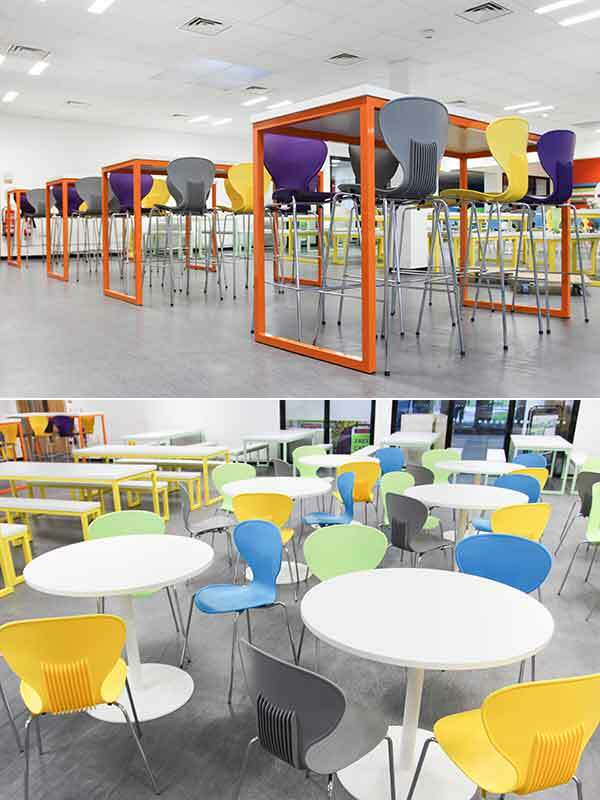 They were the chosen supplier from the CPC Office Furniture framework to renovate the College’s canteen. EFG faced an interesting challenge with this design project. The brief from the College was to design a space that maintained the current capacity whilst at the same time introducing structure and a much needed update in style. The canteen furniture consisted of out-of-date tables with fixed beam seating that made it difficult for students to get in and out of. As a consequence of years of student footfall the furniture also looked sparse. The College wanted their new canteen to look more modern and friendly for their students. They wanted a nice, easy to clean area while still retaining a current capacity of 240 students. EFG worked very closely with the College to ensure every fine detail of their brief was delivered. The College were extremely happy with the end result. The dedicated planning team at EFG created an interior solution that held 254 students (more than their current capacity) and the project came in under budget for the College!